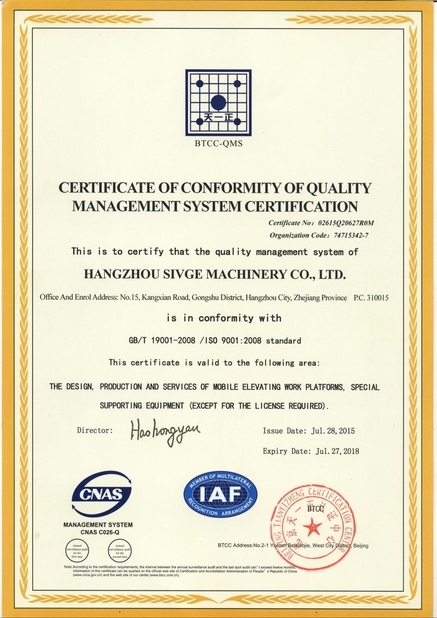 HANGZHOU SIVGE MACHINERY CO., LTD. Assembly workshop is the key point for good quality products. We keep some standard models finished products at stock for quick delivery for customer with urgent needs. 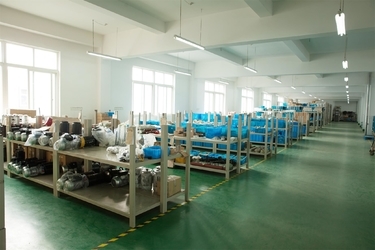 Warehouse for parts, which is located at the second floor of the other building, everything parts are placed on order, it is our strong back for effective delivery. Pursue perfect in design, seek flawless in manufacture. SIVGE adheres to providing high quality products and globally sourcing suitable and reliable key components such as hydraulic parts and electrical parts to ensure the product quality. Our professional workers and production lines, enabling us to meet your products requirements. After assembly debugging, machine will be push / drive to product test well which is belong to our QC dept. Only after all tests are sucessful and machines is in order, they will be packed according to the packing list that sales dept. provided with. SIVGE regards product safety as basic point of connecting to users. 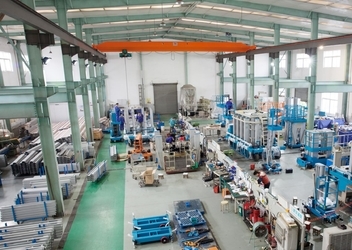 1) SIVGE firmly adheres to domestic and international standards in the process of designing, manufacturing and transporting; the strength of the parts and the stability of the whole machine must undergone strict calculation and experimental verification. 2) All products are tested by the national authoritative testing institutions. 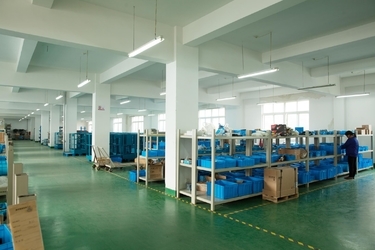 3) The production process, inspection and parts purchasing are fully in accordance with quality assurance system. We can be your best suppliers for aerial work products. Also we are capable in providing OEM and ODM services. 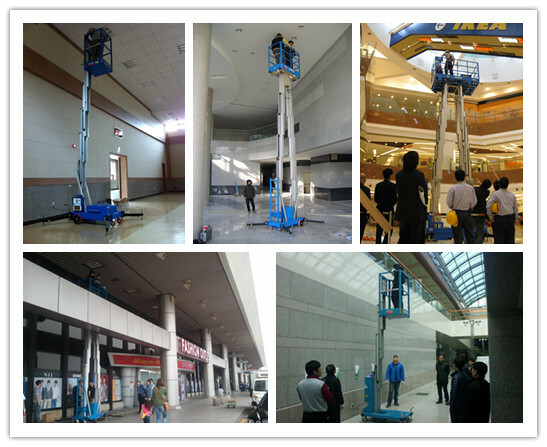 Main products: single mast aerial work platform, double mast aerial lift, self-propelled aluminum work platform, scissor working platform, one man lift, hydraulic lift ladder, aerial order picker, trailer mounted lift, vertical mast lift, and electrial lift tables etc. If our standard models can not fulfill your requirements, please back to us below infromaiton for design service. 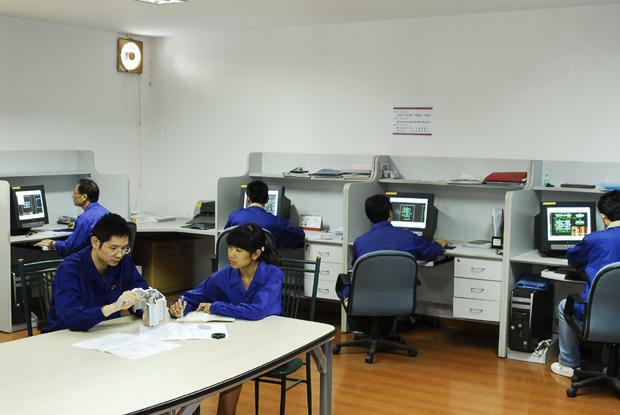 Sivge is the drafter for a number of national standards,equipped with High-tech R&D center. National key scientific and technological support projects industrial base. The only thing SIVGE technical team has done in the past 20 years is research on the aerial work platforms, especially mast platforms.Each SIVGE innovation is the effort of our employees. 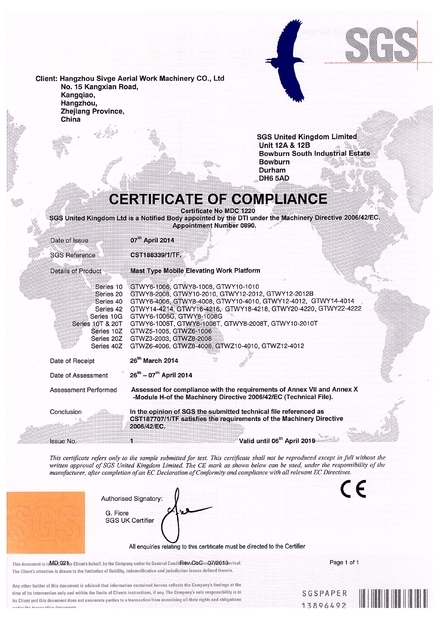 We obtain dozens of patents and utilize these patents in our products. SIVGE is focus on portable mobile elevating work platforms, lifting mechanism synchronization, outriggers rationality, machine stability, operator comfort, and control of advanced, pleasant appearance, user reliability, complete varieties and specifications and other aspects to create a unique brand. 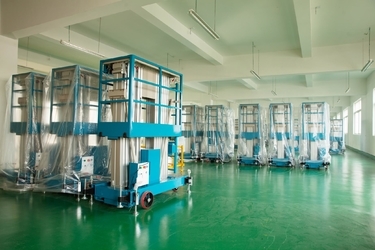 China Good Quality Aerial Work Platform Supplier. Copyright © 2017 - 2019 aerial-workplatform.com. All Rights Reserved.